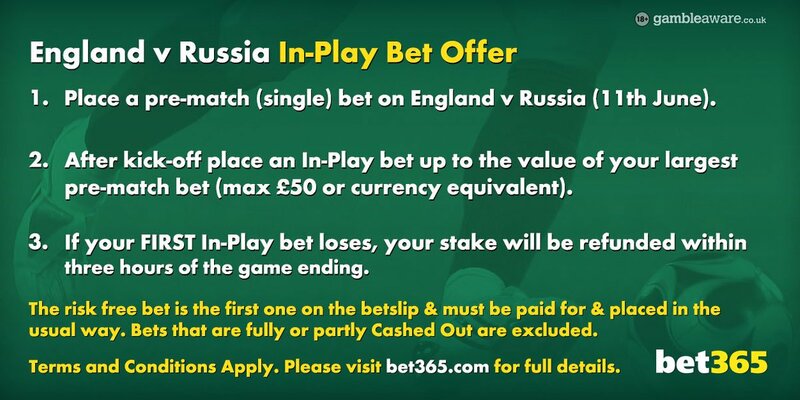 England take on Russia at Euro 2016 on Saturday 11th June and bet365 have relaunched their unmissable risk-free in-play bet to the same stake on the big match, up to €/£50. Available to new and existing customers. Find here how to take advantage of this free bet offer! The Three Lions are priced at 10/11 (1.91) to win the match, a potentially attractive price for punters who believe that the Three Lions will post a comfortable victory. Russia won each of their last four group games by an aggregate of 12-1 under Slutsky in order to secure automatic qualification to the Euro finals behind Austria and ahead of Sweden. It wil be an entertaining match and you can enjoy it with the best betting promotion offered by Bet365! Most people have their own tactics when it comes to using the promotion and many are betting on the same market both in-play and pre-match. As an example, you could bet £50 on England to win pre-match and then in-play, get on both teams to find the back of the net. Stake £50 on "Over 0.5 match goals" pre-match as qualifying (to win this bet we need 1 or more goal in the game). Once the game has kicked off, go for a correct score at a bigger price. Eg: 2-1 England at 9/1. Risk free bet value will be equal to the stake of your largest pre-match single bet placed on the England v Russia Euro 2016 match, played on Saturday 11th June 2016, up to a maximum of £50*. Pre-match bets that are fully or partly Cashed Out will not qualify for the offer, whether Cashed Out pre-match or In-Play. The largest pre-match bet that has not been fully or partly Cashed Out will qualify (up to £50*). "England v Russia £50 risk-free in-play bet at Bet365"